Reve De Sivola made full use of the enforced absence of Big Buck's to claim Grade One glory in the Long Walk Hurdle at Ascot. Soon tracking Kayf Aramis, who opened up an early lead, Richard Johnson bided his time on the Nick Williams-trained seven-year-old before just taking off in front some way out. The 9-2 chance steadily stamped his authority from there and jumped particularly well barring one slight error, opening up going to the final flight and streaking clear for a 14-length success over favourite Smad Place. 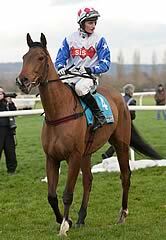 Reve De Sivola won a Grade One as a novice hurdler at Punchestown in 2010, and was second to Big Buck's at Newbury earlier this month on his first start for almost a year. Williams said: "He's probably a better hurdler than a chaser, and his first run back was after recovering from an injury. It worked out nicely today as he had plenty of space and it was an impressive performance. "We will go for the World Hurdle, but I always injure horses at Cheltenham - it's not my favourite course and he wants heavy ground, but he will have to take his chance. "We will see how he is, as he doesn't necessarily have to have another run." Paddy Power gave the Paul Duffy-owned Reve De Sivola a 10-1 quote for the World Hurdle. Alan King said of runner-up Smad Place, who stepped up on his returning third in the John Smith's Hurdle at Wetherby: "I was delighted with him, he handles heavy ground well but probably doesn't stay three miles one on it. "It was better than Wetherby and he could either go for the Cleeve or the National Spirit at Fontwell before the World Hurdle."